Käthe Buchler (1876-1930) was an amateur German photographer, whose collection of images has been assembled into an exhibition, entitled ‘Beyond the Battlefields’, currently being displayed at Birmingham Museum and Art Gallery, and the Rotunda Gallery at the University of Birmingham. This is the first time her photographs have been displayed outside Germany. Her images provide an insight into the experience of war for both the civilian and soldier. The photographs depict a varying range of experiences, from domestic family life to soldiers recovering in hospital following injury, and they offer an extraordinary look at the life of ordinary Germans. These photographs contribute to a history of both the civilian and soldier’s experience of the First World War, and explore a range of themes including gender, children, trauma and injury. The exhibition also explores amateur female photographers. These photos are a valuable historical source that can give an intimate glimpse into every day life, creating thought-provoking social histories. Photographs prompt interesting questions, such as for whom are the images intended? What role do they have in creating shared memory? And why were they taken? This form of female amateur documentary photography is highly valuable, as its purpose was to capture everyday life, and therefore it had minimal political motivations, allowing for honest moments to be captured. Women used photography often for diverse, and very personal reasons. In the case of Buchler, who suffered from a hereditary disease causing deafness, photography offered a different form of communication and means of expression. The second part of the exhibition, currently on show at the University of Birmingham, has a collection of Buchler’s images of injured soldiers, alongside other photographs and history of the University’s role during World War One. The University played an important role in the war as a military hospital. Across the four years of war, more than 125,000 men were treated in Birmingham, from across Europe and the British Empire. Preparations for this had begun years before the outbreak of war; in 1908 plans were made for the Aston Webb building to be used as a hospital in the event of conflict, and instructions for effective mobilisation were ready. With the outbreak of World War One therefore, mobilisation of the building was quick, and the University became the 1st Southern General Hospital. The university received its first soldiers on 1st September and by the end of 1914 had received nearly 4000 patients, arriving via Moor Street Station in the city centre and latterly through the Selly Oak Goods Station. Together, these two aspects of the exhibition – Büchler’s photographs and images of the University – demonstrate similarities between the impact of war on people’s lives in both Britain and Germany, particularly for the injured soldiers and nurses who cared for them. They provoke important questions into the impact of trauma resulting from the conflict, and the experience of warfare at home. 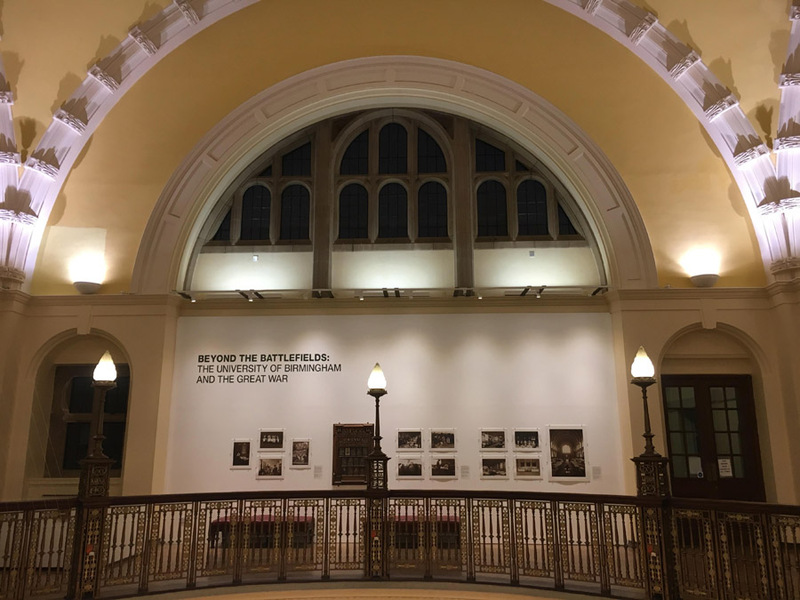 Beyond the Battlefields is a touring exhibition co-organised by the UH Galleries, Photomuseum Braunschweig and the AHRC funded First World War Engagement Centres at the University of Birmingham and the University of Herefordshire. The exhibition is currently being displayed at both Birmingham Museum and Art Gallery and the Rotunda Gallery in Aston Webb (open Monday-Friday, 9am-6pm). Admission is free, and the exhibition is on until 14 January 2018. There is also a range of symposiums and workshops taking place alongside this exhibition. For more information please go to Voices website: www.voicesofwarandpeace.org or follow @Voices_WW1 on Twitter and Instagram. ©Copyright 2019 ALPHA. All rights reserved.